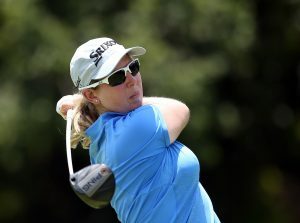 South Africa’s top ranked Ashleigh Buhai remains the player to catch with 18 holes remaining in the Canon Sunshine Ladies Tour Open at Irene Country Club. A bogey-free five-under-par 67 on the opening day boosted Buhai to the top of the leaderboard and she continued her stunning start in the 2019 season-opener with another flawless performance on day two. The Johannesburg professional will take a staggering seven-shot lead into the final round after a four-under 68 moved her to nine-under 135. “Obviously I am very happy with my score, although I felt I played a lot better in the first round,” said Buhai, who is gunning for her 10th title on the local circuit. 1. Ashleigh Buhai set the 36-hole mark in the Canon Sunshine Ladies Tour Open at nine-under at Irene Country Club; credit Sunshine Ladies Tour. Buhai started the second round three shots clear. She extended her lead with a birdie at the par five second and kept her advantage intact with a further gain at eight. “Coming into the round, I wanted to maintain that three-shot lead,” she said. “I managed to do that with the two birdies on the front nine, but the back nine was a little iffy. I managed to scramble well to keep myself in it. “I made a really good par-save at 10 after I hit it in the trees. I had to punch out and made the up-and-down for par from 60 metres out. I birdied the next hole and I stayed patient, because I knew I had some short holes coming where I could take advantage with wedges. Is she surprised to be leading by such a huge margin after two rounds? 2. 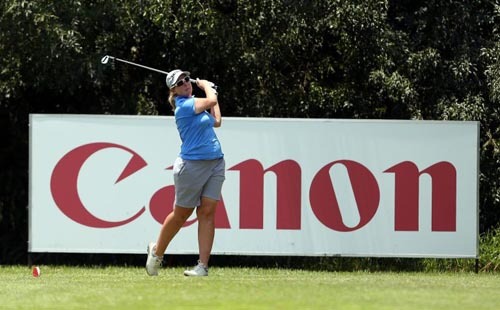 Rookie Casandra Hall from Benoni moved to second at the 36-hole mark of the Canon Sunshine Ladies Tour Open at Irene Country Club; credit Sunshine Ladies Tour. Benoni rookie Casandra Hall and former Ladies European Tour winner Anne-Lise Caudal from France join Buhai in Friday’s leading group. Hall was even-par at the start of the round and got it four-under during her outward loop. The 2018 SA Amateur Women’s Stroke Play champion made three bogeys on the bounce coming home, but a birdie-finish for a round of 70 moved her to two-under. Caudal also returned a 70 to finish a further shot back. “I’m looking forward to playing with Anne-Lise and Cass,” said the world number 116. “Anne-Lise and I have known each since I first went to play the Ladies European Tour and we are good friends. She is very solid tee to green and I expect her to go low in the final round. 3. The youngest starter to make the cut and in her first start! 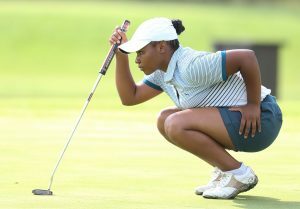 SAGDB member & GolfRSA TDI Squad player Pheletso Mota (16) during the Canon Sunshine Ladies Tour Open at Irene Country Club; credit Sunshine Ladies Tour. Top ranked Kajal Mistry leads the leading amateur challenge on five-over after carding rounds of 72 and 77. Fellow GolfRSA Elite Squad player Symone Henriques is a further shot back. Three more amateurs made the cut to the top 30 professionals and ties, which fell at 156. Ernie Els and Fancourt Foundation member Larissa Du Preez (153) and Alison Muirhead from Scotland (156) will join the line-up alongside SADGB member Pheletso Mota. The GolfRSA Talent Identification Squad player from Kroonstad bounced back after an opening 81 with a 74 to finish on 155, making her the youngest starter at 16 years old in Friday’s final round at Irene Country Club.